Photo credit: BostonTweetUp. 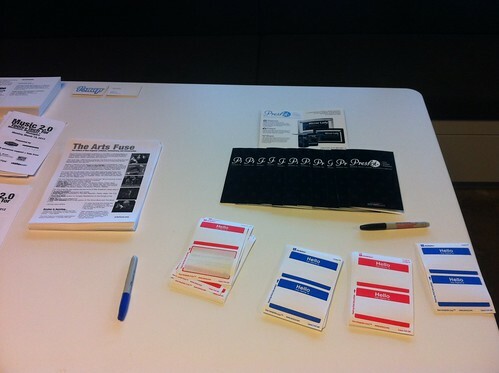 Taken at Music 2.0: Tools + Tech for Musicians, Marketers + Managers. By now you’re probably all ready to launch your event and you’re ready for the fun to start. You’ve used platforms like Facebook and Twitter to invite every networker to your event, and platforms like LinkedIn and Google+ to share the event link, with a registration sheet as well as the time and location of the event. So anyone who is anyone will be at your event. So that’s great! You’ve done a great job at promoting it! But now, we want to show you how you can continue to leverage these top 5 social media platforms (Facebook, Twitter, LinkedIn, Google+ and Blogging) which we covered in the first post, but this time how to leverage them during the event. So if you missed our first post, take a quick look. You’ll want to know these tips first before we can move on to the second part: Top 5 Social Media Platform and Tips for Organizers Part 1. In the first post we discussed how it is important to use these platforms to spread the word of the event so that you reach out to networkers and get them to attend, but now we want to tell and show you why it’s important to continue sharing updates of the event as you are in the midst of it. So the reason why it’s crucial to use these platforms while you’re there at the event is because you are the organizer! And as the organizer your role is to make sure everyone is having a great time and that everything is running smoothly. So what better way to show that everything is going swimmingly then by using the the top 5 social media platforms. By using these platforms you can share live updates on the event as it is taking place and share how it’s coming along. So how exactly can you share on these platforms during the event? Well that’s what we’re here for. We’re going to walk you through every step of the way. Update a status and let your FB friends know “where you are” at the event. By tagging your location you can let others know exactly where your event is located by showing it on the FB map. Update your status and let your friends know who you are with at the event. By tagging your location and your friends, you can let others know who else is currently there at the event with you, so others know who to expect. Check into the event by using apps like Foursquare and sharing it on FB. This let’s everyone know that you are there and to look out for you. This is also a great way to help promote the venue. Update your status with a photo. Show your friends the event so that they know what to expect when they arrive and make sure to tag anyone who is in the photo. Share a post on the event page. A photo, who you are with, or anything that let’s other attendees who are going know how the event is going. Compose a tweet about the event by using the event hashtag. Let everyone know that you are there and ready to get started. 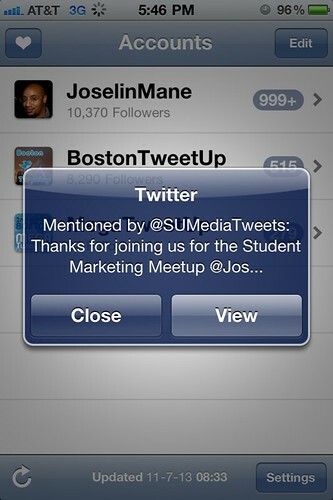 Tweet with who you are with at the event by using their twitter handle and the event hashtag. This let’s the Twitter community know who else is there and who else to follow on twitter. Tweet a Twitpic of the event as it is taking place, to let others visually see how the event is coming along and so they can see who else is there. Make sure to use the event hashtag and the twitter handles of anyone who might be in your picture. Share a video. You can use apps like Vine and @Vsnap, that are fun tools that allow you to take quick video clips to share on Twitter. This will give the Twitter community a quick glance of the event. Share an update and let the entire LinkedIn community know that the event is now taking place. Make sure to use the event hashtag for easy finding. Share an update on the event page, and use the event hashtag. This will allow all members who are going to see the current status of the event. If any other member is posting updates on the event, make sure to like their post or leave a comment. Let them know that you are thankful for their arrival and are looking forward to meeting them. Use CardMunch to take a photo of any business card you may have received so that you can convert it to a contact and find their LinkedIn profile later. This is a very handy tool. Post tweets directly from your LinkedIn. Instead of going to both Twitter and LinkedIn, you could kill two birds with one stone by sharing it on LinkedIn and having it redirected to your Twitter. This will save you time. “Share what’s new” by letting the entire Google+ community know that you are at your event and that it has begun. Make sure to incorporate the event hashtag for easy finding. Share a photo of the event, maybe the one of the speaker speaking or one of sponsors handing out merchandise, so that the Google+ community can see what’s going on at the event. Share a video of the event to share with the entire Google+ community. Share videos live on the Google+ event page to all the event guests, by turning on party mode. On the Google+ event page, use party mode to snap and share photos as they happen in real time right from your phone. This allows everyone at the event to share and stay connected. Take tons and tons of photos. You’ll want to use these late in your blogs. Who doesn’t like looking at pictures right? Take videos. Try to take a couple videos of the speakers or attendees whilst they network, so that you can later use these in your posts. Jot down the names of anyone you meet and interact with because you might want to mention them in your blog. If you mention specific people, they will most likely read your blog post. Meet the sponsors, speakers, venues and hosts and possibly ask them a few questions about what they think of the event you have organized. Ask them if they wouldn’t mind if you mentioned them in your blog post. This could get you potential new readers. Publish your photos from WordPress to Tumblr. So next time you’re at your event, try these tips out. Share the event as it is happening with your social media followers in real time. This is a fun and easy thing to do and it is a great way to stay connected with everyone during the event. This will also make it easier to find attendees and stay connected even after the event is over. Now, if you want to learn more on how you can continue to network even after the event is over via the top 5 social media platforms, then check in with us next week. Or if you are interested in learning more tips and resources make sure to signup for the upcoming Networking 2.0 Book and subscribe to this blog. As always, leave your comments below and let us know what else we could help you with! Otherwise, see you next week!